Recovering after a traumatic injury can bring grateful feelings of survival, quickly followed by, "how bad will the scars be?". Scarring is an amazing way the skin heals itself, however, depending on the severity of the injury, scars may leave garish marks that are not only bothersome on a cosmetic level but also on a physical one. While only time will tell how it will develop, there are effective treatments to ensure the best outcome of a scar. Skin regenerates naturally approximately every 27 days, which means that dead cells rise to the surface of the epidermis as new ones are made below to replace them (1). But when skin is inflicted with a wound, it does not regenerate. Instead it creates a scar to close the open area. Fascinatingly, even though they look different, both the skin and scar are composed of the same material, i.e. collagen. Located in the dermis are fibroblasts which are cells that produce collagen. 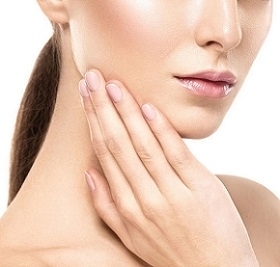 Collagen is a highly important protein which acts to connect cells together as well as give skin its elasticity and stretchability. Normally collagen connects cells together by forming a basketweave or cross-stitch pattern. When a wound occurs, the body is in distress and signals for excess collagen to be produced. Then collagen works to close the wound and arranges itself in a parallel stitch (2). This accounts for the fact that even though they are both composed of collagen, scars look very different from the rest of the skin. Interestingly, fetal collagen differs from adult collagen and will actually regenerate skin without producing scars. In addition, when skin is stretched too quickly due to weight gain or rapid growth, it disrupts normal collagen production and thus results in stretch marks. There are topical creams and gels which lighten and fade their appearance. Skin is made of 3 layers: epidermis, dermis and subcutis. Collagen is produced in the dermis and is responsible for the elastic nature of the skin. When skin cells naturally regenerate and replace themselves, collagen connects them together via a criss-cross pattern. However, as tissue scars, collagen is arranged in a parallel stitch. This accounts for scars and skin differing in appearance. Keloid Scars - Characteristics of keloids include scars that are: raised, red or pink in color and larger than the original cut or injury site. They can also be itchy or tender. What makes some people develop keloids over others depends on the darkness of their skin - they are more prevalent in Blacks, Asians and Hispanics - as well as their genetic predisposition to scarring. If you have relatives who have keloid scars, you may be at risk for developing them yourself, even from a body piercing (3). Hypertrophic Scars - These are also red, raised scars which may be itchy or painful. 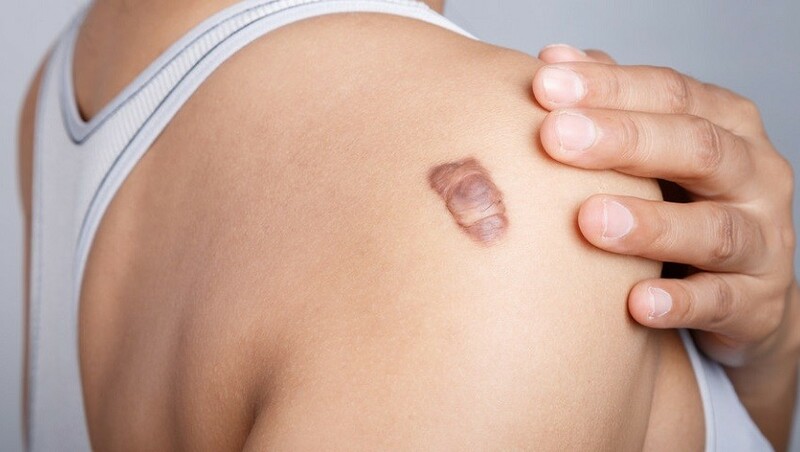 What differentiates them from keloid scars is that they don’t go beyond the site of the injury. Hypertrophic scars will usually stick to the borders of the wound. In addition, they can be thick and if they are located near a joint, may actually restrict movement (4). Acne scars - Popping pimples may be enjoyable in the short term, but it’s not worth living with the scars of puberty throughout adulthood. Depending on the severity of the acne, scars can range from narrow, deep holes (icepick scars) to larger cavities. These types of scars are caused by chicken pox as well (5). Contracture scars - These are scars which are formed after a burn and may be dark colored. Contracture scars will vary in appearance depending on the degree of the burn. These scars may tighten the skin and it impair movement, depending again on how many layers of skin was affected by the burn. Types of scars include: keloid, hypertrophic, acne and contracture. Keloid and hypertrophic are characterized by raised, red scars and are largely determined by the severity of the wound as well as a person’s genetic makeup. Keloid scars tend to grow larger than the original wound whereas hypertrophic scars do not. Acne scars are usually pitted in appearance and can result from popping pimples. Contracture scars result from a burn. The more severe the burn, the more severe the scar will be. Treating scars can only occur once a wound is completely closed. Included below are options for all types of scars. Each individual scar should be assessed by a medical professional in order to provide the appropriate treatments. Healthy diet - Taking care of your skin from the inside is often neglected, but it is crucial. 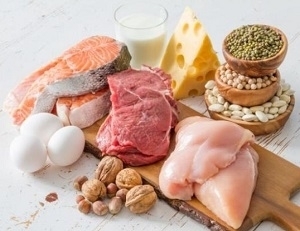 Eating healthy amounts of protein and vitamin C are necessary for the body to produce collagen in order to make new skin cells which will close the wound. The proteins and minerals needed are similar to those needed to produce healthy nails. Gels and creams - The best skin gels and creams will work to fade scars and rejuvenate skin. In studies, silicone gel was observed to make a real difference during the formation of a scar (6). In addition, there was also research done on onion extract as an effective treatment (7). When purchasing a gel, look for these key ingredients. In order to get optimal results, apply to fresh scars. Compression/pressure garments - Even though there is a lack of scientific evidence to support the use of pressure garments, they are widely recognized as being effective in treating hypertrophic burns (8). Depending on the area of the body, pressure garments may not be suitable. Obviously, pressure garments are tight fitting, but there are medical guidelines to ensure they are not too tight that they might cause damage such as bone growth. Surgery - Depending on the type, size and location of a scar, surgery may be an option. This is done in extreme cases where quality of life is compromised due to scarring. One type of surgery is a skin graft which will use your own skin from another location in your body. Chemical peels - Chemical peels remove the epidermis, and can be effective at removing superficials acne scars. Those who are predisposed to keloid scarring should be cautious of any procedure, like this one, which creates new wounds. Laser treatment - Laser treatments are short pulses of light which are aimed at specific locations on skin to remove the affected layers. The type of lasers used and the recovery time depend on the type and severity of the scar. Shallow acne scars, for example, respond very well to laser treatments and have a relatively quick recovery time. Dermabrasion - Dermabrasion involves removing layers of skin by hand using instruments such as sandpaper, salt crystals, wire brush, etc. This is a surgical procedure done by a dermatologist or surgeon and has a recovery period of about 7-30 days. Most people prefer newer laser treatments as they don’t involve as much bleeding (9). There are many different treatments for scars. Including: a healthy diet, gels and creams, pressure garments, surgery, chemical peels, laser treatment and dermabrasion. The location, type and size of a scar will determine which treatments are appropriate to use. Accidents happen. Skin is amazingly versatile in the way it protects the body from external harm. As skin rejuvenates and repairs itself, it may leave unattractive or painful scarring. Luckily, there are real treatment options, many of which are extremely effective when treating fresh scars. Some people will require extensive treatments depending on the location and severity of scars as well as the pigment of their skin and their genetic makeup. As research continues in this field, we look forward to more treatment options which will be even more effective at reducing or eliminating scars.